Home » ★★★★★ » Frantzén, Stockholm. Brain food. I will see if you can come in, says Lurch, at the door, formal and forbidding in his dark, heavy overcoat and bowler hat. We are ten minutes early and are left standing out in the cold. More like a speakeasy than a restaurant, this is not the sort of warm welcome we might have hoped for. 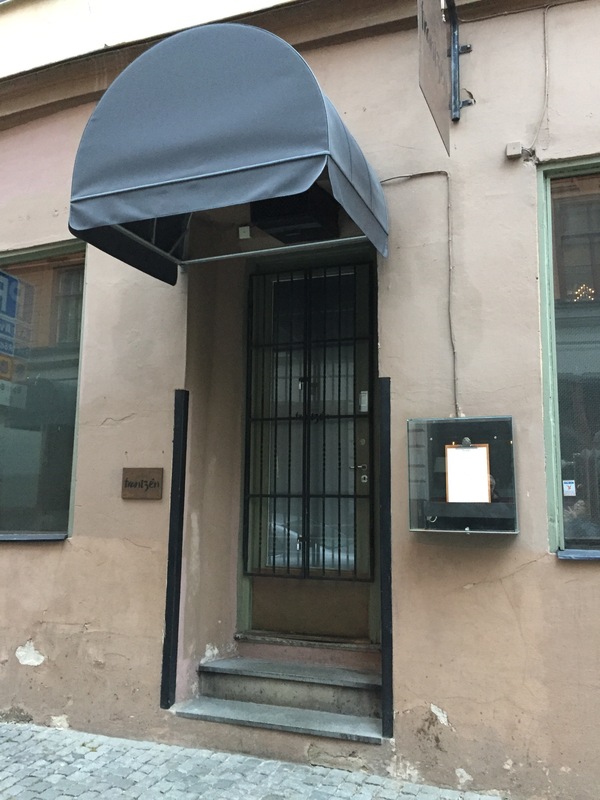 Their website had nailed it, with its spectacular service on acid, added to which I’ve got a bit of a thing about Swedish design, so it was easy to talk myself into a weekend of food and furniture. 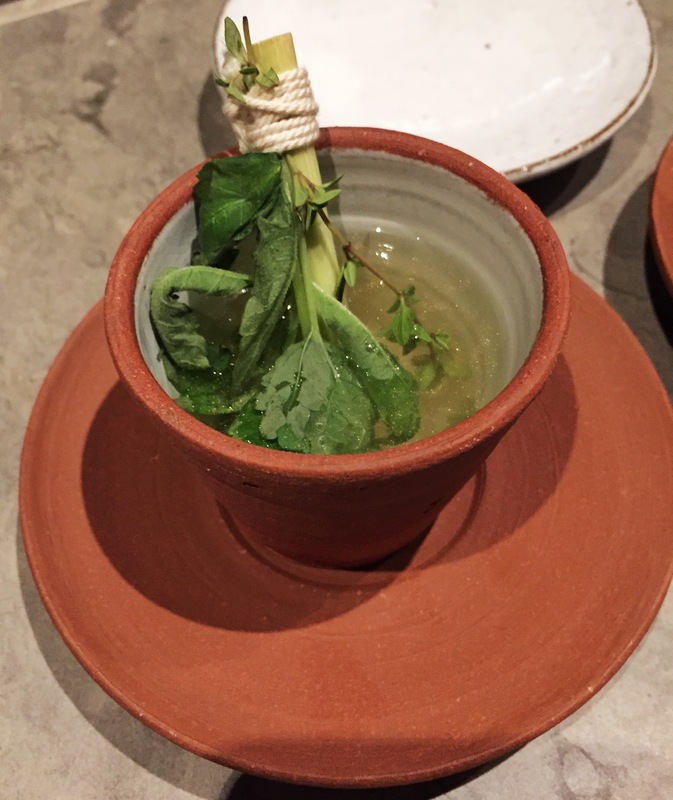 I knew that we were in for a forage-y Noma-seque experience, because they’d asked whether there was anything we didn’t eat and emailed the menu. For all my going out, I am not a food adventurer and my team would starve on I’m a Celebrity, should there be a lawyer version, so I declined the horsemeat/frozen liver sushi and left it to C to try the 28-day dry-aged cured piece of Dobbin. When finally permitted to enter, we stood around whilst a few people in grey greeted us and then we sat at the bar overlooking the kitchen, almost in it. There was no gap between the eating and preparation areas. Tip 1: wear a cool shirt. I was wearing a boiled wool dress, which was clinging attractively to my back by the end of the evening. Tip 2 : If you have personal space issues, do not sit at the kitchen table. So close are the chairs that they have to push you in and there is an inch or so between chairs, maybe not that much. Obviously I worried that they weren’t strong enough and whether the strain of doing so had caused the particularly pungent body odour emitted by one of the waiters. I thought at first that it might have been a particularly challenging culinary aroma, but no. Someone needs to tell him and I mean it with love. And they don’t have wines by the glass, but they will use the wines from the wine flight except you have no idea what they might cost. Until the end, when it’s too late. 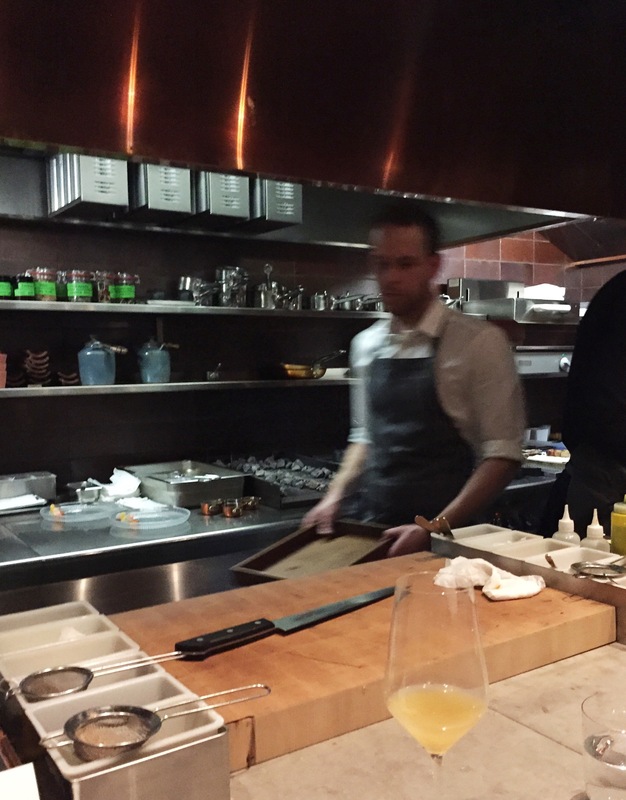 I noticed that the nine chefs in the kitchen were all male. I’m interested in that and whether that bears any relationship to the type of food served here. I see foraging as quite a male activity, not your average bit of mushroom-gathering, but the sort of foraging which results in the gathering of edible moss. Some moss is poisonous you know, says Max, our principal chef. A fair few of the ingredients also sound a bit iron man of the North to me too. 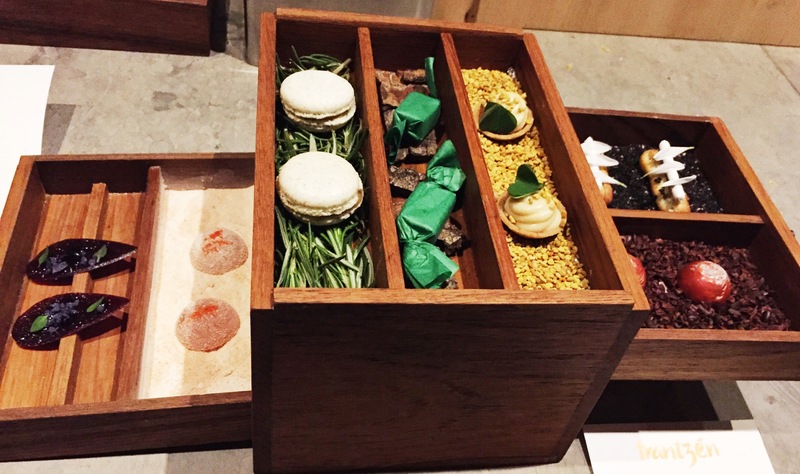 Macho ingredients, such as blood crème, used both in the savoury macaroons and one of the chocolates in the petit-fours selection, pig tail jus, and emulsion made from crab guts. 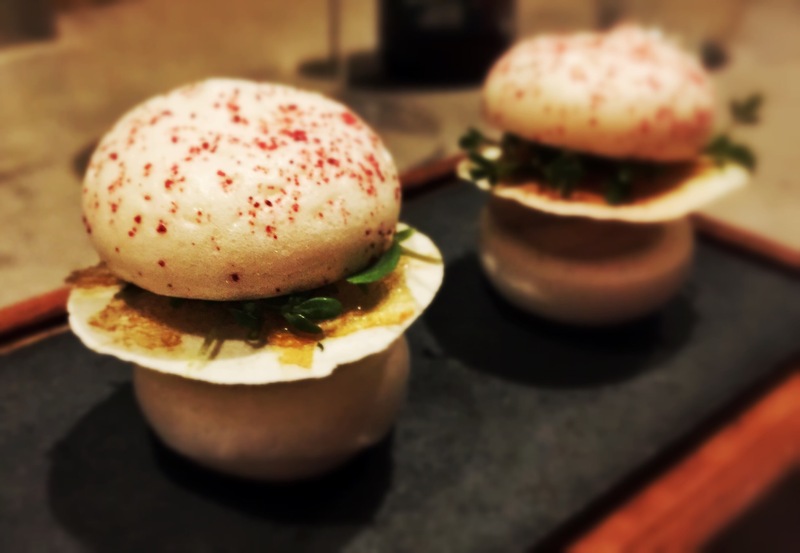 And you’d never know those things were there, unless you had seen the menu and even when the menu gives you some idea of the main ingredients, they tell you even more about the provenance of the ingredients and the cooking processes, as they serve it. You have to concentrate, otherwise you might miss something. I could easily see why one might think that this was food-wankery of the first order but after the first few courses I realised that whoever put this menu together has a sure touch and knows how to make interesting and unusual food. I did wonder how I’d have felt about it without the explanations and how much they added to the whole experience. Like wine, when you know what to look for, you can really taste that liquorice note, or smell that gooseberry. So it seems to me that if you know that a dish contains, say, sea urchins, sour carrots, and walnut and saffron cream, you’re going to be looking for a taste of those ingredients, even when they aren’t immediately obvious and many of the stated ingredients weren’t obviously present but were there to add depth, or a fleeting flavour or note. In many cases, if you didn’t know they were there you wouldn’t know they were there. The chefs work in each course like a production line. Much tweezing and squeezing of ingredients in impossibly intricate patterns. A pinch of this and a dusting of that, powders, oils, gels, pastes and salts, the area in front of us looks like a science lab crossed with a kitchen, as yet another plastic container bearing some unrecognisable ingredient is opened and then replaced and another blob of oil is squeezed out of a tiny nozzle. And they do that whole call and reply thing as the head chef controls the service like a conductor, although I did feel it was more of a rock concert, what with the tattoos, the obligatory beardie, and the rugged grungy appearance of some of the chefs and even more when all of them were introduced, in turn. Bless them, they all waved. I was secretly hoping for one of them to do a bit of a chopstick solo on a pan lid, but they were a bit busy, what with all that tweezing. Sixteen courses does look a bit daunting, even for me, but at least five of them were to be eaten in one go, although I ignored that and tried them in two bites to try and taste each of the ingredients. And get the food all over my hands. 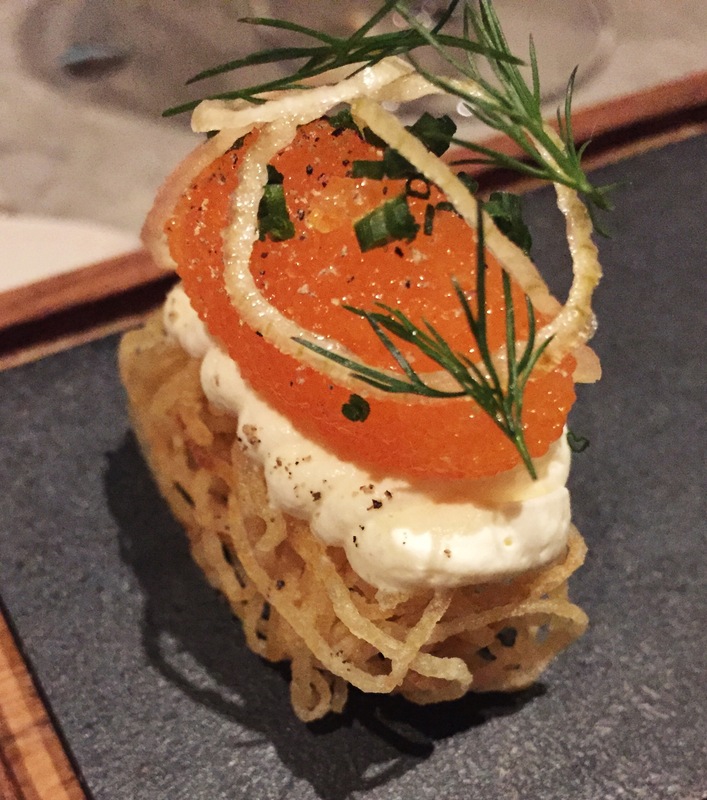 Many of the courses were a meal in a mouthful, in terms of structure, like the Råraka, a traditional dish, made on a nest of deep-fried potato, like a child’s squiggle drawing and with just enough sour cream and onion to stand up to the strong salmon and caviar flavour. 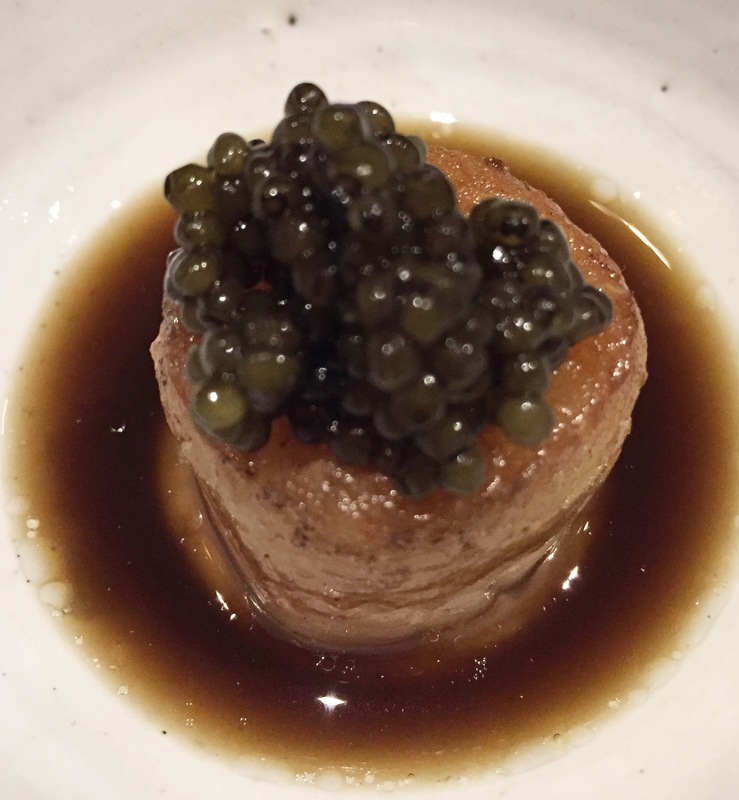 And soft, melting bone-marrow, the consistency of a crème caramel, wobbling in a soured mushroom juice and as if that wasn’t a big enough umami hit, smoked chestnut paste, adding a sweetness and the caviar giving little pops of seafood flavour to finish it off. Toasted rye bread with dried butter was excellent, like twiglets of sourdough with powdery salty butter sprinkled over. I could have eaten bowls of these, one of the few carb offerings. They don’t do bread, as such. They used to, but people got too full. I’m grateful and sad at the same time. Not everything was pretty. Looking less than lovely was the langoustine, deep-fried for 4 seconds then rolled in shaved soft truffle, not before being brushed with pig’s tail jus and ‘perfumed’ with aged ham. I couldn’t taste the pig bits if I’m honest but I could taste the langoustine, with its texture like silky butter, melting on the tongue, and an aftertaste that lingered till the next course. 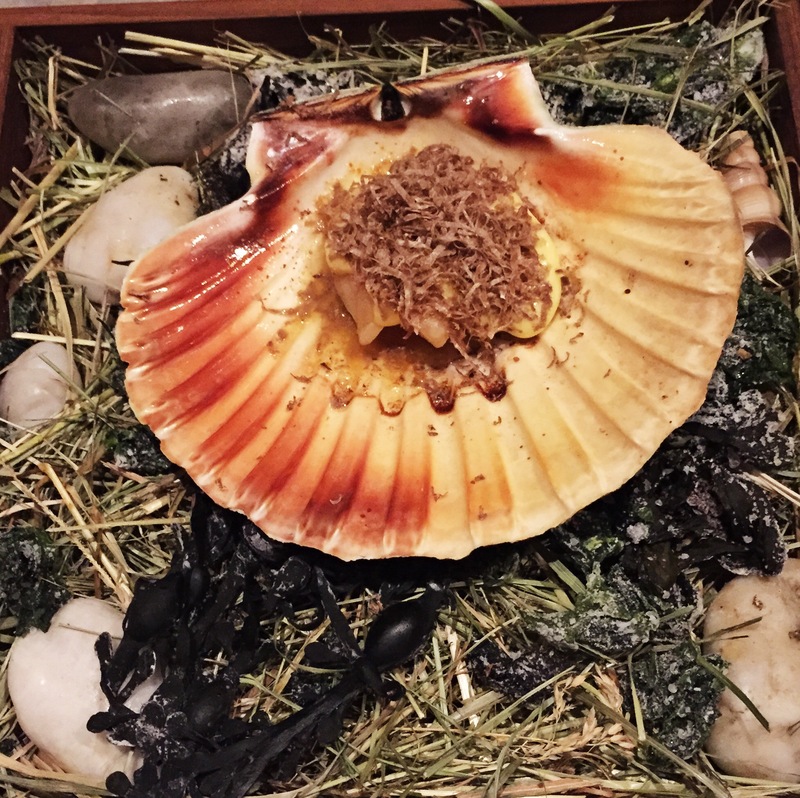 Scallops were served in the shell, which was heated on white-hot coals, in four slices ranging from cool to hot, with a buttery sauce and the juices mixed with a dashi to finish. And did I mention the Satio tempestas, a signature dish, with thirty-seven ingredients, all grown in their own garden, served, variously steamed, raw, dried, fried and creamed? Not only that but before you get it, an envelope is delivered to the table, with an explanation of this dish and a list of the ingredients. Which, in the cold light of the following day does seem rather self-important but at the time was interesting. I gave up trying to identify the thirty seven items. Served with the butter they whipped with herbs, tableside, which they had melted in a red hot copper pan, so that it made a large plume of steam before they drizzled it over the plate. And the other memorable mouthfuls were the crispy fish scales, on top of caramelised cod loin, with the best smoked roe I’ve ever tasted; a dessert of salted egg whites and sharp raisin syrup, with yeast ice cream and shaved semi-dried egg grated over, like lurid Parmesan and the sweetbreads, with a burnt béchamel, almost like a smoky custard. For all its seemingly challenging ingredients, the food was restrained and delicate almost as a deliberate wrong-footing experiment. 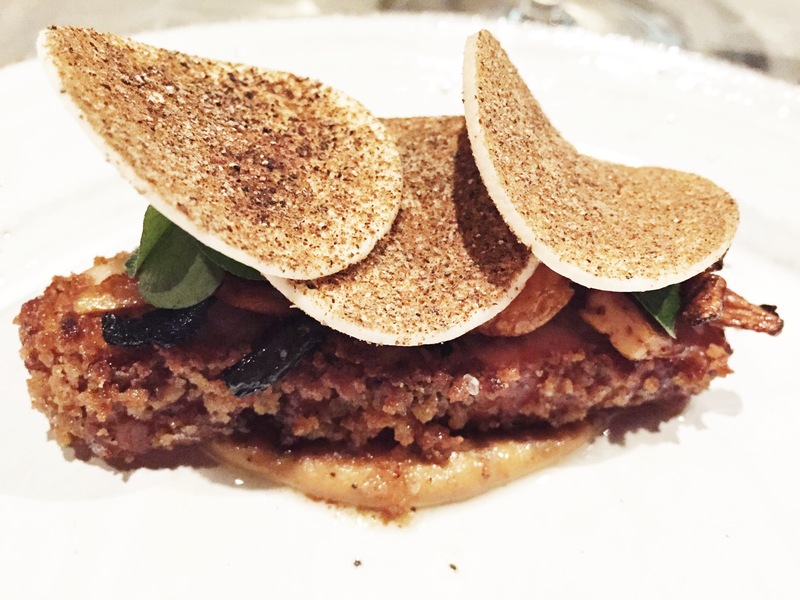 At first glance, this could not be further from traditional, Michelin formal tableside waiter fussiness yet it is the younger funkier brother of that very tradition, assembling ingredients and finishing them off in a very personal way. The theatre of food, but with the equivalent of DV8 rather than the RSC. This is about as far away as you can get from a daily changing menu. 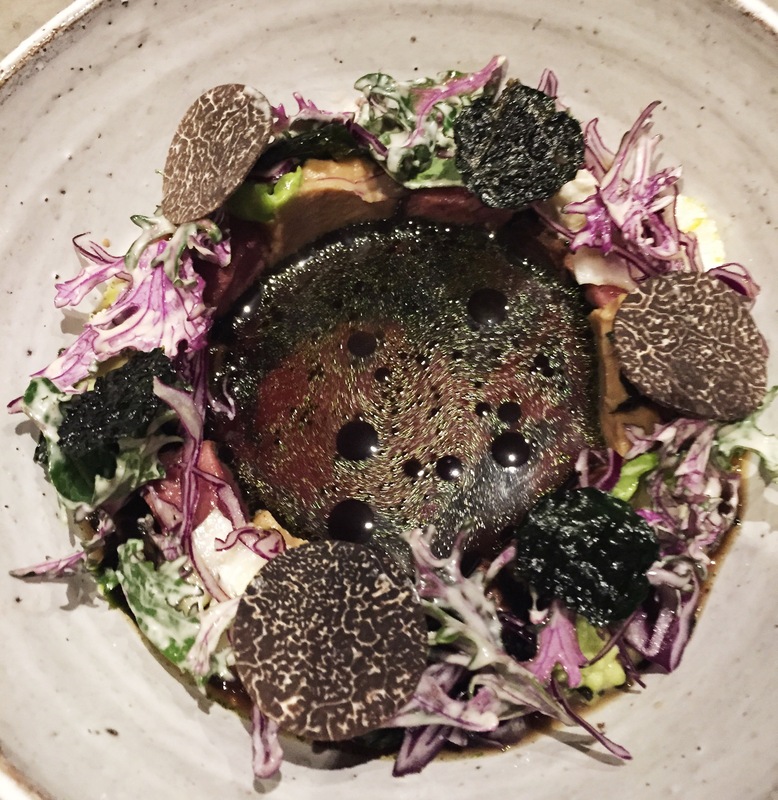 It is cookery by design, with dishes created by chef adventurers, using the produce of their surroundings but referencing food fashions of Northern Europe. I’m not buying the cookbook; I’m told it doesn’t have any recipes in it and anyway, this isn’t the sort of food I’d cook at home. This is eating out as an exercise in intellect as well as aesthetics; if you engage your brain as well as your tastebuds, you’ll enjoy it more. Not quite the same attention to detail as the interior. A warming cup of tea. Well, a cup of something, with herbs in it. Råraka : sour cream, black pepper, Vendace roe from Kalix and onion. Squiggly potato joy. Lingonberry and apple macaroon, with blood crème and foie gras, dried duck jus and apple. 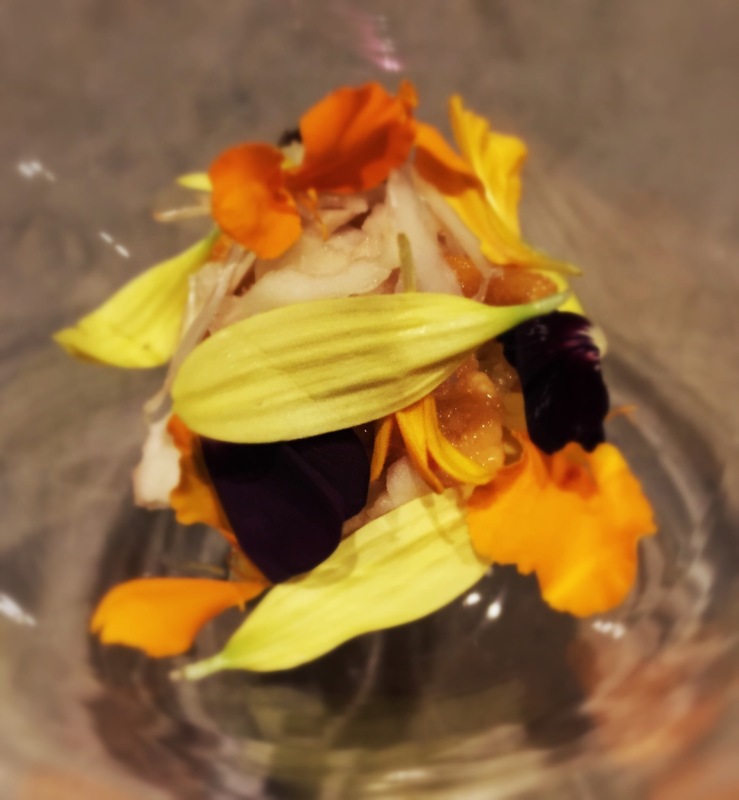 Sea urchins with pumpkin and wild flowers, sour carrots, walnut and saffron cream with farmed flowers. Orange everything, under the petal blanket. 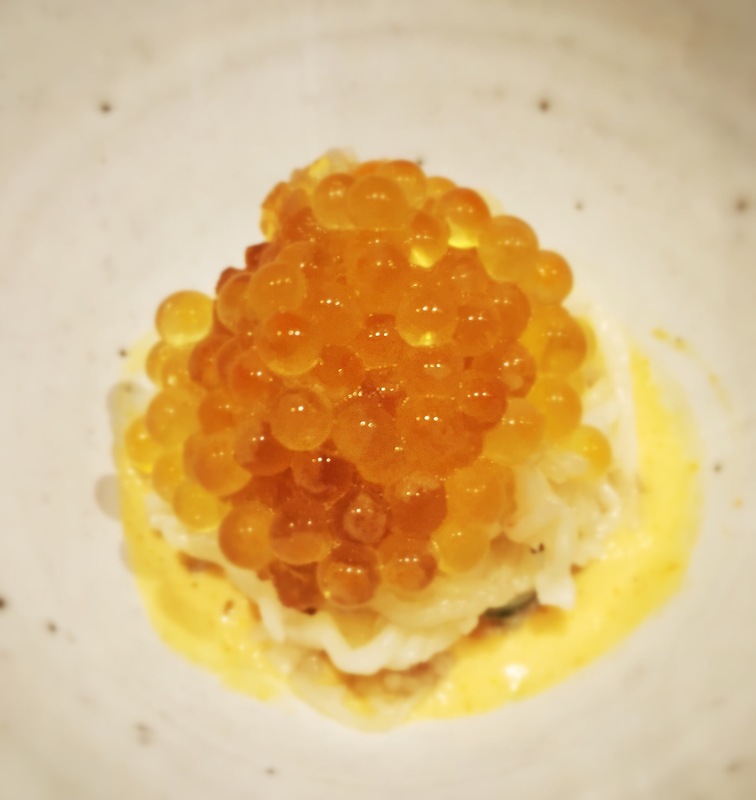 King crab poached in beer, with dill juice, gelée of the shells, wild char roe and emulsion of the guts. Gutsy flavour, obv. 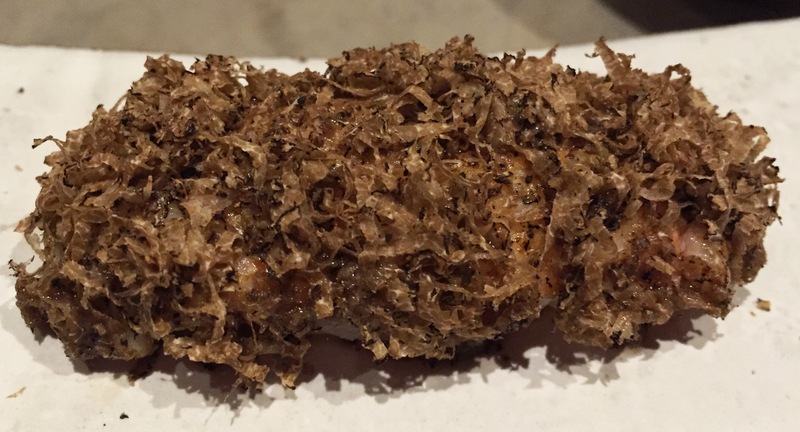 Deep fried langoustine “4 seconds” brushed with pig’s tail jus perfumed with aged ham rolled in truffle. Luxury log. The virgin sushi. Missing the horse but adding the mushroom. Unbridled joy. 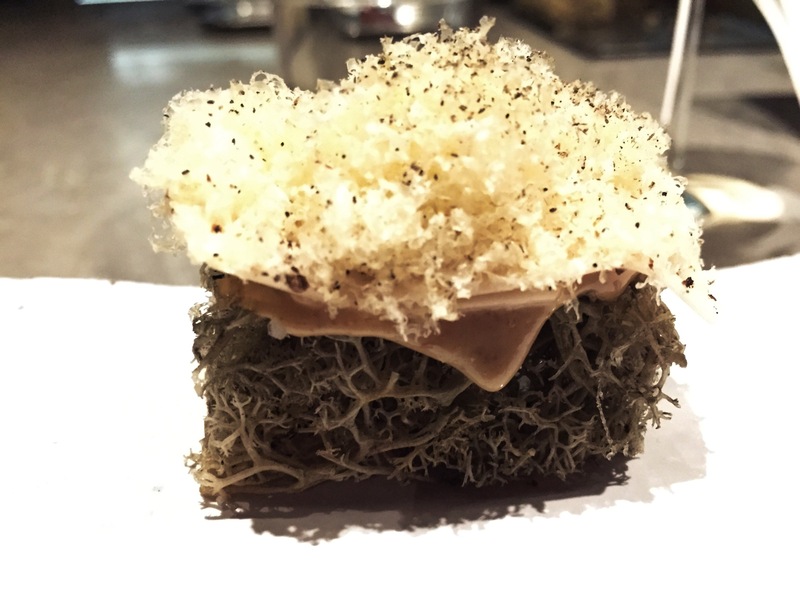 Oven baked bone-marrow, with smoked chestnut caviar “Gold” and soured mushroom juice. Umami central. The bread course. 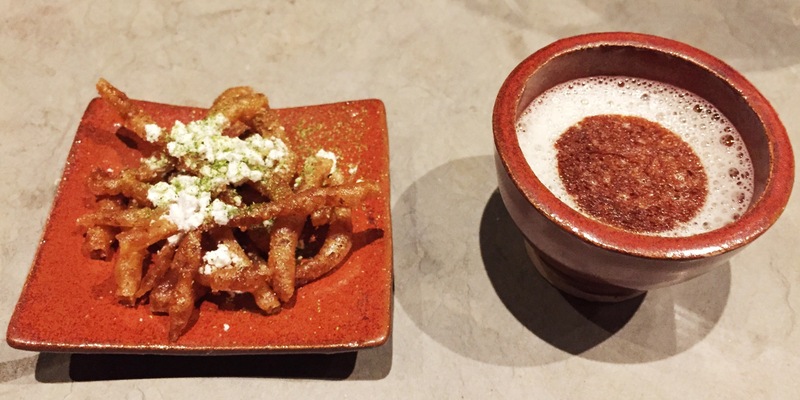 Rye bread soup with smoked bacon and crème fraiche; deep fried sourdough with dried butter. Bread and butter. Sort of. 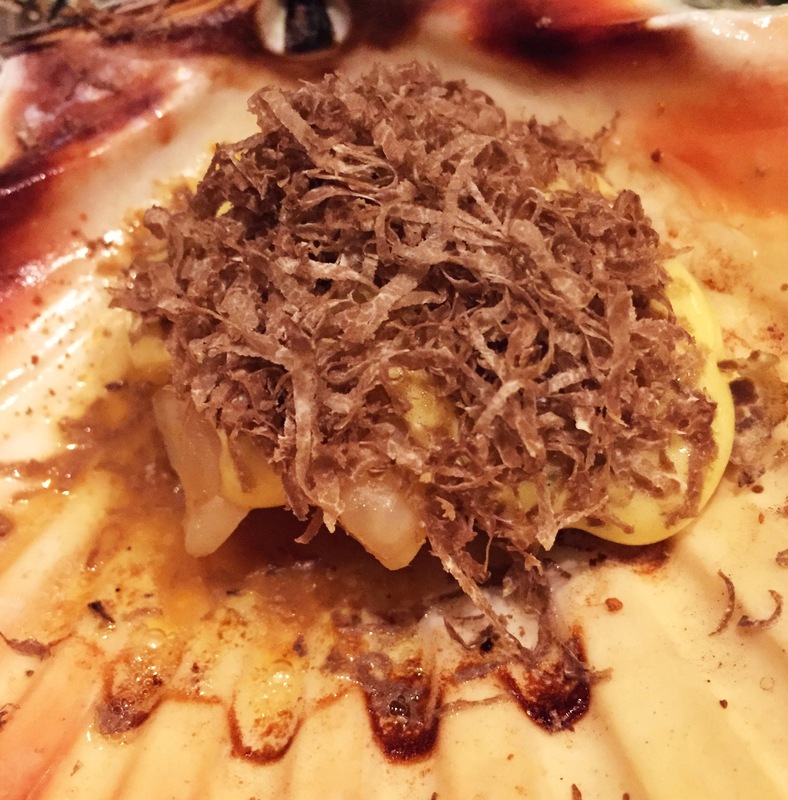 Scallop with whipped eggs, truffle and dashi. Four temperatures. 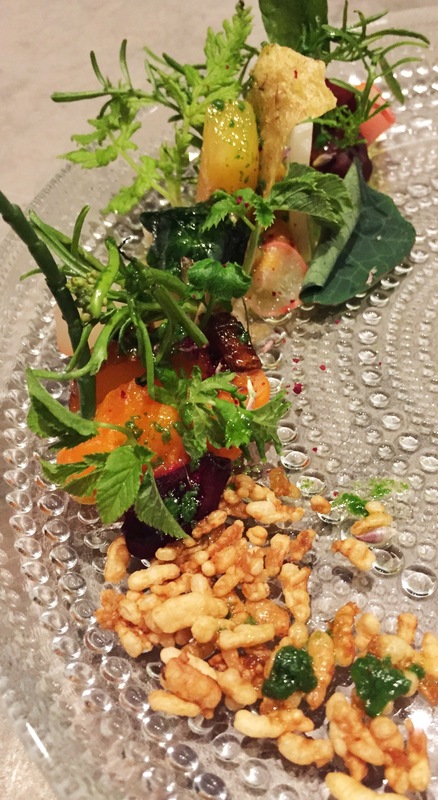 Satio tempestas with butter à la minute, biodynamic grains, toasted seeds and crispy rice. The full garden Monty. 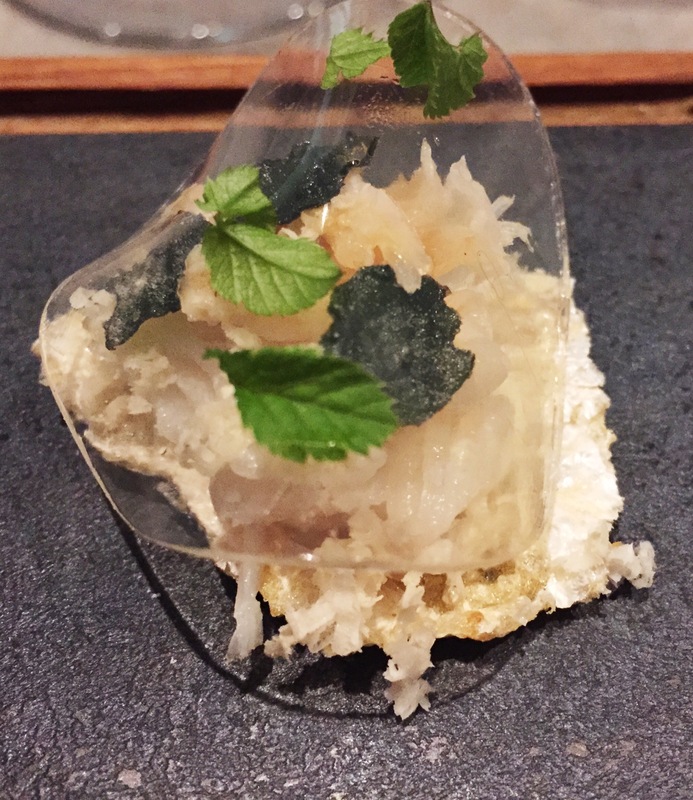 Swedish Cod Part I – skin with confit cheeks, horseradish, yogurt and reduced apple juice. That plastic looking thing an apply jelly. 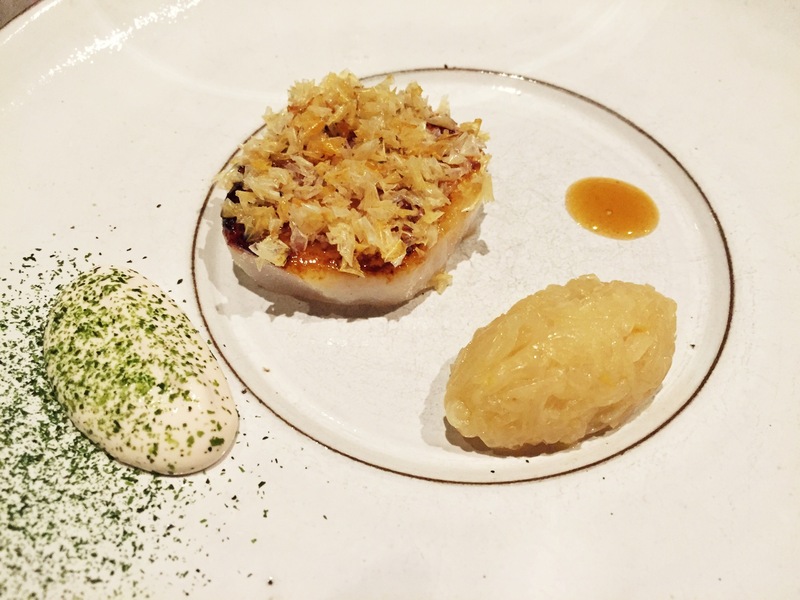 Swedish Cod Part II : Caramelised loin “mi-cuit” glazed with reduction of grilled bones and white soya with smoked roe and fried scales. Fishy crisps. Sweetbreads “mie de pain” with salted nuts, wild mushrooms and burnt béchamel. Hazelnut joy. “Hot pot” of red deer and cabbage, with roasted cauliflower and truffle bouillon. 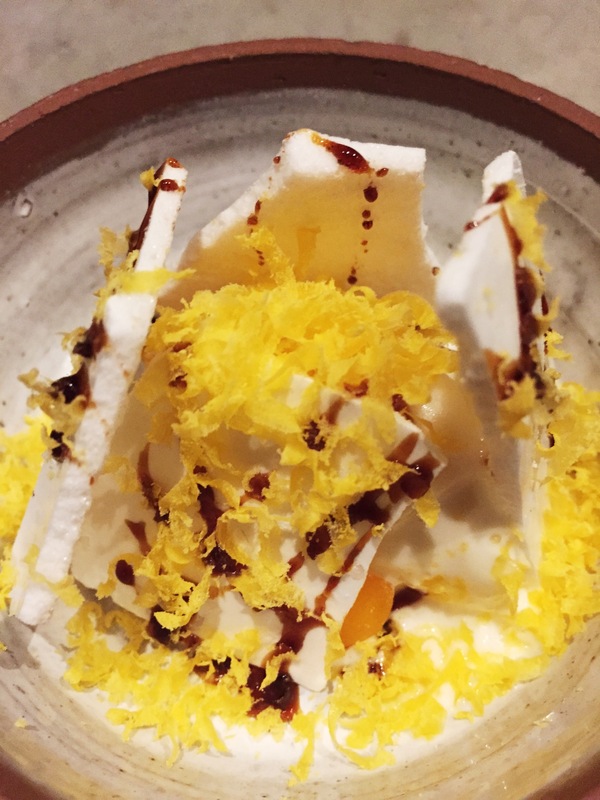 Yeast ice-cream, whipped ale with smoked, dried egg yolk, salted egg whites and warm raisin syrup. 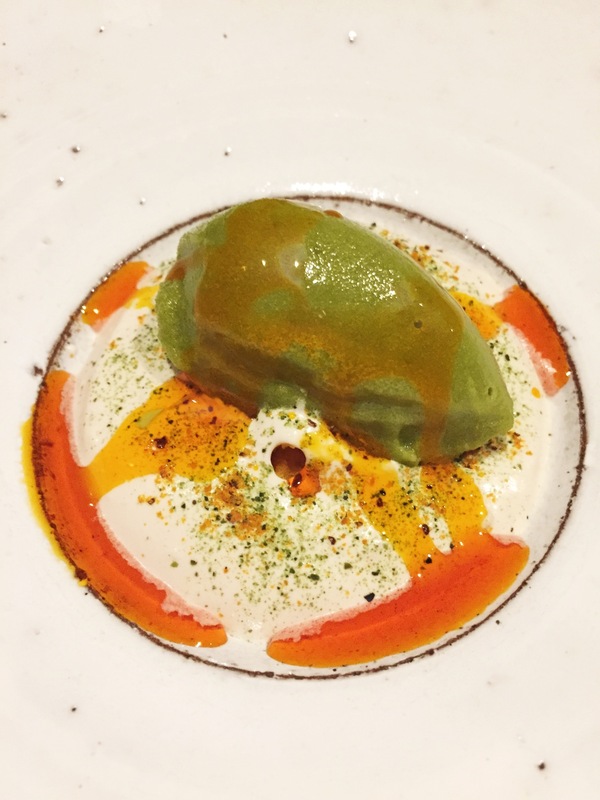 Blue and green tea, with sea buckthorn and crystallised sea lettuce. Bento box with “fika”. Seven sweets. It’s traditional. I can stand the heat, although the dress needs a wash now.